Catch up on the adventures of degenerate genius Rick Sanchez and his bumbling grandson Morty as they explore the outer reaches of time, space, and anatomy. This volume features writer Tom Fowler in collaboration with series artist CJ Cannon in a three-issue tale of missing heads, galactic doom toasters, and Jerry screwing everything up (of course). 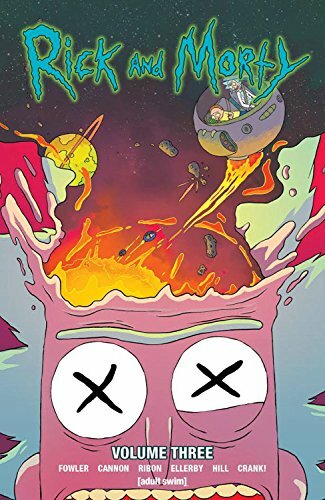 Also included is "Ready Player Morty," in which Rick takes Morty to a High School Simulation planet, by writer Pamela Ribon and artist Marc Ellerby, as well as a high-action deathball tournament one-shot written and drawn by Tom Fowler. Come for the jokes, stay for the soul-crushing ennui.